Rachel Lowe, A Pauper Lunatic. 'At the Trocadero last night there were some fine coloured films of sun-bathed coast, refreshing to the returned holiday-maker'. 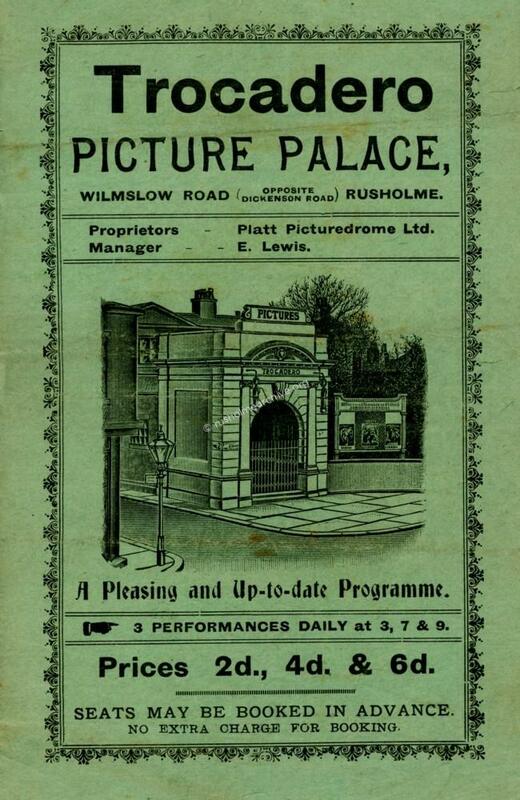 A programme for May 31st 1915 has recently been found showing the films for that week. This programme, (below) was very kindly given to the rusholmearchive by Mrs M Chorlton and her generosity is much appreciated. In the illustration above the entrance is set to the edge of Moor Street on the left hand side. To the right there appears behind the notice-board a garden and a house. This does seem to correspond with the map illustration below. I remember that when visiting the 'Troc' you walked down a corridor before coming into the theatre. As the skating rink and subsequently the cinema was at the back of the house I can only presume that later the house was demolished and the site including the garden was built over. At the bottom of this page is a photograph of the Trocadero in 1959 and that clearly shows the old entrance as in the programme above but with the later shop fronts to the right. The Trocadero Orchestra accompanied the silent movies that were being shown. You might wonder how many musicians there were? 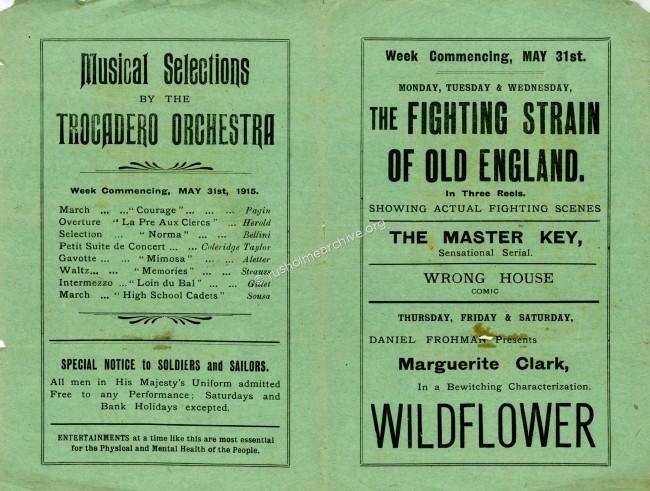 Sound movies did not become part of the Hollywood industry until some 10-15 years later, so you might find it interesting to know that the movie Wildflower being shown on the Thursday, Friday & Saturday was as the front page proclaims part of; A pleasing and up-to-date programme. 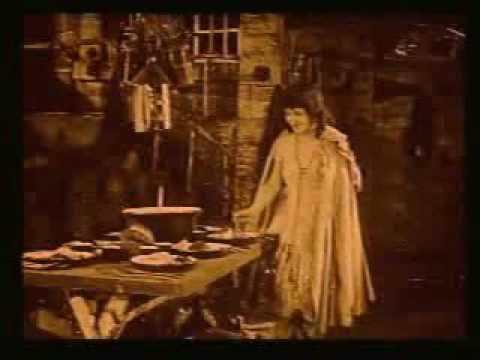 Wildflower was a 1914 American silent romantic drama film produced by Adolph Zukor and directed by Allan Dwan. It starred stage actress Marguerite Clark in her first motion picture. Marguerite Clark would be one of the few stage stars to go on to superstardom in silent pictures. 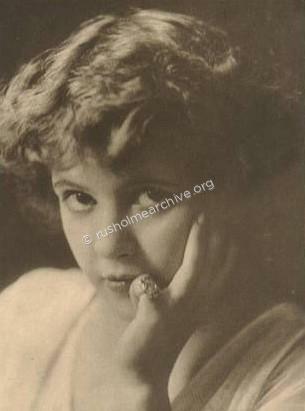 At age 31 it was relatively late in life for a film actress to begin a career with starring roles, but the diminutive Clark, who stood 4 ft 10 in (1.47 m) tall, had a little-girl look, like Mary Pickford, that belied her years. Also, film was not developed or mature enough to showcase Clark at her youthful best at the turn of the century. These were one of the reasons established Broadway stars refused early film offers. Feature films were unheard of when Clark was in her early 20s. The film Wildflower is now considered to be lost. As one of the most popular actresses going into the 1920s, and one of the industry's best paid, her name alone was enough to ensure reasonable box office success. Marguerite starred in 40 films and the last was Scrambled Wives. Scrambled Wives was made under her direction, following which she retired at age 38 to be with her husband at their country estate in New Orleans. After the death of her husband in 1936, Marguerite Clark spent time in New York City, where she died from pneumonia in 1940 at the age of 57. She was buried with her husband in Metairie Cemetery in New Orleans. Watch Marguerite Clark in the 1916 film 'Snow White' showing at your personal Trocadero! The movie, 'The Fighting Strain of Old England' seems to be rather less known. It was categorized as a short war film directed in 1914 by David Aylott with a cast of George Wynn, Joan West, R. Harley-West, Ashore J. Vincent and Winnie Dangerfield. Illustration below is the back page of the programme. 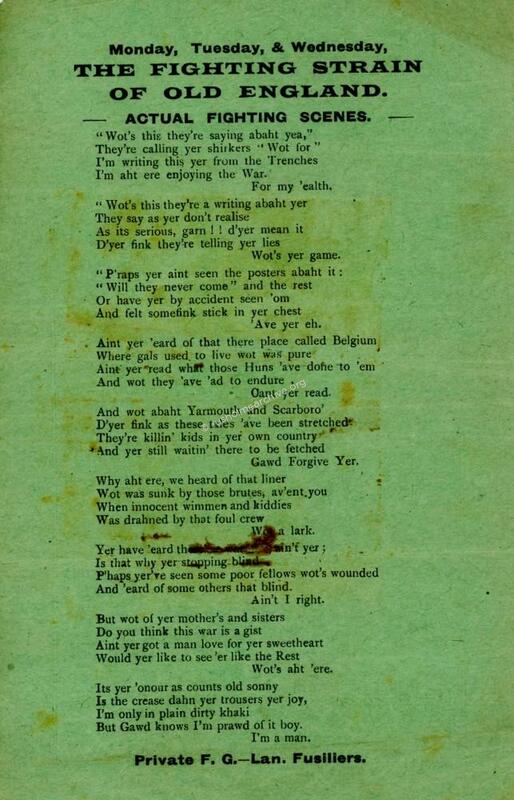 The poem is obviously directed at an audience concerned about WW1 and was apparently written by a private in the Lancashire Fusiliers. The photograph below is from the Manchester Local Archives 'Images' collection, (m06331) and I very much appreciate permission being given to display this photograph. 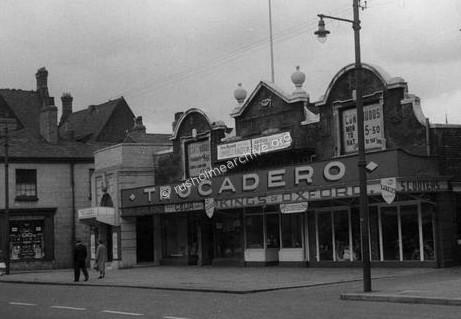 The Trocadero remained opened for some 60 years before demolition in the 1970's. The site is now occupied by a supermarket. Images on this website may not be copied without prior written agreement.